Happy Death Day hit back in 2017 and turned out to be a basic yet still enjoyable horror sci-fi slasher with a Groundhog Day (1993) spin. I didn’t think it was good enough to warrant a sequel but it was green-lit immediately and not even two years later we have this sequel which is cleverly titled. 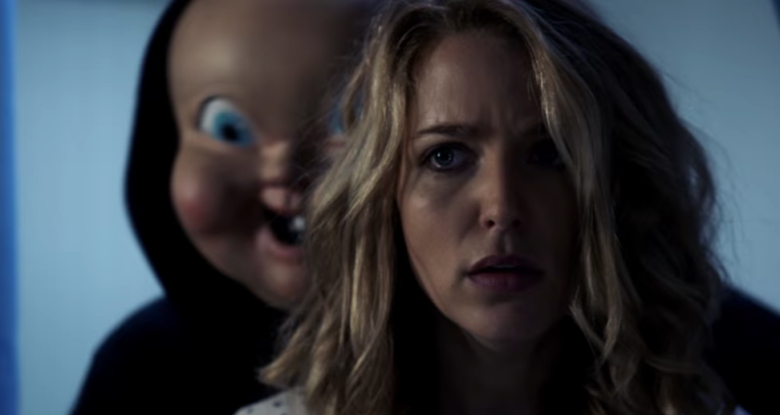 Happy Death Day 2U reintroduces us to Tree Gelbman (Jessica Rothe) who once again finds herself back in the same loop, but this time things are different and getting out of it is going to be much harder. I didn’t expect a whole lot from this sequel as I didn’t feel like there was enough in the story and concept of the first film that could be expanded into a sequel. But I have to say I was mistaken because Christopher Landon, who returns to direct this sequel, pulls it off. It builds off the first film very well to where the two feel like a tight pair with a fairly unified story. It expands on the lore in some creative ways I definitely did not expect. It goes more into the sci-fi elements and explains the science, however flawed, of how this loop is being caused. It’s still a pretty by-the-numbers horror slasher but that doesn’t mean there’s no fun in it. This sequel goes for the jokes a little more than the first film did. Not all are very effective but it keeps the tone a little lighter, upping the enjoyment factor. The mystery is what draws you in and keeps you engaged; who is the killer? The question is present in the story again and as expected it’s a bit of a ride to get there. I enjoyed the first act as it sets up this new time loop, I had fun with the second act where the characters try to escape the loop, but I can’t say I enjoyed the final act which falls apart. It’s a shame the last 20 minutes or so is a mess because up til that point I was really enjoying it. There’s emotional family elements injected into the story that I didn’t love and feel like some filler to bump up the runtime. Some odd plot choices are made in those final moments that drag the ending out just a bit too far. The ending seemed to keep on going and it ruined whatever flow and building suspense was set up earlier. It leads to a mediocre ending and an even more mediocre and disappointing mid-credits scene. As with the first film, Jessica Rothe’s performance really elevates the film to that point of being enjoyable. She really sells the fact that her character is stuck in a time loop, again, and is the heart and soul of the story and humour. Ryan Phan (Phi Vu) is a character from the first film who is featured a lot more prominently this time around. He is a major factor in the progression of the story and I quite enjoyed him this time around. Israel Broussard is back again as Carter and like the first film he’s a fine character. Not a whole lot to him so he jumps in and out of the story when he’s needed. In the end, Happy Death Day 2U is a solid sequel that I’d say is a slight improvement on its predecessor. Aside from the novelty of a Groundhog Day and horror slasher crossover it’s nothing too far from other films in the horror slasher genre. Jessica Rothe is a standout once again and is the reason the story is as enjoyable as it is. There’s a neat Back to the Future (1985) reference in here too which as a fan I loved. Check this one out for a fun and easy horror flick if you enjoyed the first film.